• 8-character alphanumeric display with icons for quick identification of radios status and incoming calls. • LED status indicator allows clear indication of radio's operating status. • 4 Programmable buttons provide users convenient access to the most frequently used functions. • 16 pin external accessory port or optional board interface allows easy expansion of radio’s capability. • Supports MDC1200, DTMF and Quick Call II signaling standards. • 64-channel allows users to independently program each channel for their customised needs. • The mobile offers voice compression and powerful 4W front firing speaker for maximum audio clarity. 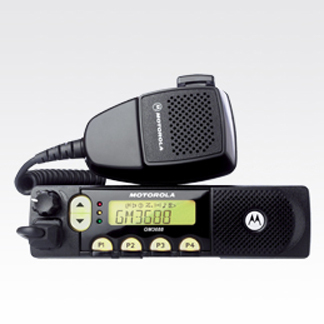 • Rugged construction built to meet or exceed the stringent Motorola ALT and MIL-STD 810C,D and E.